Squill are bulb plants that grow in the winter months. When they bloom they spread out quite rapidly. They cover the ground and look like a light blue carpet. They are pretty enough to warm up the coldest of winter days. 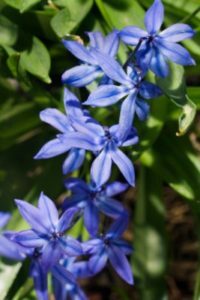 While some varieties of this plant grow in the spring, Persian Squill grows during the winter. Since they are a ground covering flower, they grow close to the ground reaching only about 5 inches in height. The leaves are almost as high as the flower itself. They are a bright green color and look like broad spears of grass. As I’ve said above, the flowers are a light blue, but they have a darker blue stripe on each petal. Each flower is composed of six petals that are bell shaped. The petals are thin and delicate. If you have decided that this is the right plant for your winter garden, they are very easy to plant and grow. They require very little maintenance. Plant the bulbs in a shady spot in loamy soil that is well drained. Dig a hole about 3 inches deep and space the bulbs about 3-4 inches apart. Plant them in the fall so that they will be ready to grow in the winter. That’s about all you have to do. Once the bulbs are planted, they take care of themselves. Just relax and take a peek out the window when you need some cheering up. The crisp look of this plant will have you thinking of spring in no time.